The 45 km (28 mile) Kanal Istanbul will link the seas north and south of Istanbul and ease traffic on the Bosphorus strait, a major global shipping lane. It will also redraw the map of one of Europe’s biggest cities, turning its western side into an island. 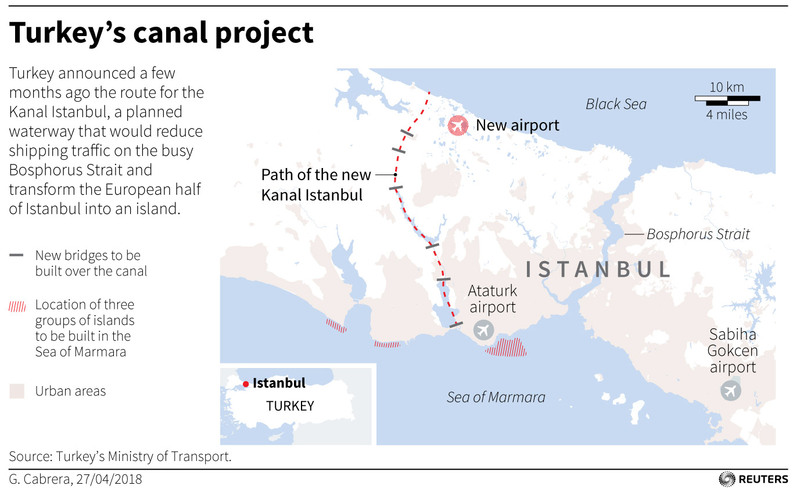 Critics, including the national architects association, have questioned the need for the canal and warned it will destroy an 8,500-year-old archaeological site near Istanbul and cause widespread environmental damage. The experience of the Sazlibosna villagers illustrates how the government has shut them out of an enterprise that could displace thousands. Estimated to cost around $16 billion, the canal is one of the most ambitious of President Tayyip Erdogan’s infrastructure mega-schemes. He has publicly referred to it as his “crazy project”. When the villagers, who described themselves as Erdogan supporters, arrived for the meeting in March in western Istanbul - a session intended to allow the public to voice concerns and learn about the project - they were met by police carrying rifles and tear gas who said the hall was full. It was - with workers who told Reuters they had been bussed in from another government mega-project. The villagers were stuck outside the hearing, in a crowd of more than a hundred people, including environmentalists, who were also not let in. “The owners of these lands need to be inside,” said Oktay Teke, Sazlibosna’s local administrator, as he stood with the villagers outside the Arnavutkoy municipal building where the meeting was underway. A Reuters reporter saw dozens of men leave the hall and board buses after the meeting. When approached, three said they were workers from Istanbul’s giant new airport, which opens in October at the northern end of the planned canal. “Projects at the airport are about to be finished. This (canal) is a job opportunity for us,” one said, without giving his name. The spokesman for the Arnavutkoy municipality, Fatih Sanlav, said only a limited number of people were unable to enter the meeting, and no workers were bussed in to fill the hall. In a decade and a half in power, Erdogan and his ruling AK Party have built roads, trains and hospitals and improved the lives of millions of lower-income, pious Turks. Under a state of emergency in effect since after a 2016 coup attempt, he has also overseen a sweeping crackdown against opponents. Erdogan says the canal will take the pressure off the Bosphorus and prevent accidents there. He says “mega-projects”, such as Istanbul’s third airport, are major contributors to the economy. Yet there is concern about overdevelopment. A protest in 2013 against plans to redevelop Istanbul’s Gezi park turned into a major anti-government uprising. The Union of Chambers of Turkish Engineers and Architects (TMMOB) criticised the canal as an environmental and urban “disaster” which should be abandoned. Some 369,000 people live in the area that could be impacted by the canal, according to the Turkish Data Analysis Centre, a research company. The canal will destroy archaeological sites around the Kucukcekmece lagoon that date back to 6,500 BC and provide the earliest evidence of the Hittites in Thrace, TMMOB said. The lagoon’s ecosystem, vital for marine animals and migratory birds, will also be destroyed. The canal will demolish two basins that provide nearly a third of Istanbul’s fresh water and will increase the salinity of underground water streams, affecting agricultural land as far away as the neighbouring Thrace region, TMMOB said. The project will increase oxygen levels in the Black Sea, impacting the wildlife population, it said. Three groups of artificial islands will be built just offshore in the Sea of Marmara from the earth dug for the canal, which environmentalists say will cause pollution there. The Environment Ministry did not respond to requests for comment. The Transport Ministry and Cinar Engineering, the company tasked with compiling an environmental impact report, declined to comment. While the Bosphorus is difficult to navigate, shipping companies do not need a new canal, said Cihangir Inanc of shipping agent GAC Shipping, adding it would be “more realistic” for the government to improve the strait. Nearly 43,000 ships passed through the Bosphorus in 2017, down a quarter from a decade ago, although ships today are much bigger, according to government data. Traffic on the Bosphorus was nearly three times that of the Suez Canal. On the banks of Sazlidere dam, Sazlibosna is surrounded by rolling hills and green fields of grazing sheep and cattle. The canal will cut through that land, as well as land around nearly two dozen different villages and neighbourhoods. At the local tea house, villagers fear the government will compulsorily purchase land that has been in their families for generations and pay less than the market value. Their concerns are fuelled by a similar experience 20 years ago, when the government expropriated land to build the dam, paying below market value and devastating local farms. “We had around 3,000 cattle then, we have 300 now,” Teke, the administrator, said. Villagers fear the canal will destroy what remains of their agricultural land. “Once this happens, there won’t be any husbandry or farming left. I’m going to have to stop farming, I don’t know what I’m going to do,” said one villager, who grows barley, wheat, maize and sunflowers. Teke said he wrote to Erdogan, the prime minister, and to government offices asking for more information about what will happen, but to no avail. Erdogan has promised to hold the tender for the canal soon, saying it will be built no matter what. “Whether they want it or not, we will build Kanal Istanbul,” he said.